EAST RUTHERFORD, N.J. (AP) — Baker Mayfield and Saquon Barkley lived up to early expectations as the top two picks in the NFL draft in their first action as the Cleveland Browns beat the New York Giants 20-10 on Thursday night. 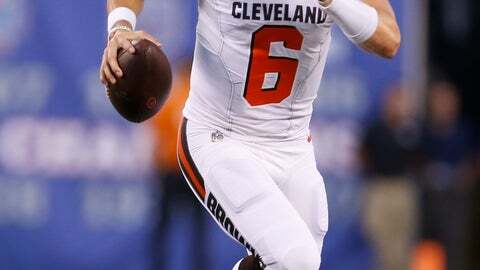 Taylor, expected to be coach Hue Jackson’s starter as Mayfield learns this season, hit all five of his passes in two series, including a 36-yard touchdown pass to Njoku, a New Jersey native. Barkley, the No. 2 pick, electrified the fans at MetLife Stadium, taking a handoff from Eli Manning on the opening play from scrimmage and turning no apparent hole into a 39-yard run down the sideline in front of the Giants’ bench. It set up a 42-yard field goal by Aldrick Rosas. SEATTLE (AP) — Andrew Luck returned to game action for the first time since the final week of the 2016 season, leading Indianapolis on a pair of field-goal drives in just over a quarter. The reintroduction of Luck as the Colts‘ leader started with a 17-yard swing pass to Marlon Mack on the first play. It concluded early in the second quarter when his pass intended for T.Y. Hilton was broken up. In between, Luck was bear-hugged by Seattle All-Pro linebacker Bobby Wagner on a scramble run, sacked by Rasheem Green, and also showed flashes his surgically repaired right shoulder is ready to allow him to again be a premier quarterback. Luck completed 6 of 9 passes for 64 yards, most of that coming on the opening drive when he hit 5 of 7. Luck completed passes to five receivers and threw from a clean pocket on most of his dropbacks, even with starting left tackle Anthony Castonzo not playing. It had been nearly 600 days since Luck was last on the field, when he threw for 321 yards in a 24-20 win over Jacksonville on Jan. 1, 2017. For one night, Luck looked like his pre-surgery form. Luck’s counterpart from the 2012 draft, Russell Wilson, played one series for Seattle. Wilson was 4 of 5 for 43 yards and capped his only drive with a 5-yard touchdown pass to tight end Nick Vannett. It was Wilson’s first action playing in the offense of new coordinator Brian Schottenheimer, which will be heavily tilted toward the run. PHILADELPHIA (AP) — Landry Jones and Josh Dobbs each tossed touchdown passes and the defending Super Bowl champion Eagles rested several starters, including quarterbacks Carson Wentz and Nick Foles. Nate Sudfeld threw a pair of touchdown passes and two interceptions. Fitzgerald Toussaint had a 3-yard TD run and a 2-point conversion, while Dobbs threw a 29-yard TD pass to Damoun Patterson. ORCHARD PARK, N.Y. (AP) — Bills receiver Kelvin Benjamin’s feud with former teammate Panthers quarterback Cam Newton continued before and during Carolina’s preseason-opening win. First, the two exchanged words on the field about 90 minutes before kickoff. Then they each played key roles in touchdowns drives in the first quarter. Benjamin caught four passes for 59 yards, including a 28-yard touchdown reception from Nathan Peterman on Buffalo’s first possession. Newton responded on the next possession, completing 4 of 5 attempts for 67 yards as part of an 85-yard drive capped by Christian McCaffrey’s 2-yard run. The bad blood between the two emerged last week when Benjamin criticized Newton’s accuracy and questioned why the Panthers used a first-round pick to draft Benjamin in 2014. It was the latest time Benjamin has voiced his frustrations since forcing his trade to Buffalo in October. Before the game, a video posted by The Charlotte Observer showed Benjamin chatting with Panthers linebacker Thomas Davis when Newton approached the two and attempted to shake Benjamin’s hand. Newton waved away Davis, and then had a brief discussion with Benjamin before the receiver began walking away. Newton followed and the two talked again. The discussion ended when Benjamin shrugged and turned to walk away, and Newton waved his hand at the receiver’s back. Newton finished 6 of 9 for 84 yards in two series. CINCINNATI (AP) — Andy Dalton made a solid debut in Cincinnati’s revamped offense, throwing for a pair of touchdowns. The Bengals were last in the league on offense last season, the worst finish in franchise history. They overhauled their leaky offensive line, and coordinator Bill Lazor injected more diversity into the playbook. It showed the first time out. Dalton went 6 of 8 for 103 yards, completing four passes of at least 20 yards. He also had an interception that wasn’t his fault — John Ross fell on his route and Kyle Fuller returned the pickoff 47 yards to the end zone. The Bears (0-2) rested most of their starters during a 17-16 loss to the Ravens in the Hall of Fame game, including quarterback Mitchell Trubisky . His preseason debut didn’t go very well. Trubisky was in for two series that netted minus-1 yard on eight plays. The Bears’ only first down on those series came on Carlos Dunlap’s penalty for roughing the quarterback, a late hit on Trubisky. He missed on a deep sideline pass to Kevin White on his opening throw and finished 2 of 4 for 4 yards. JACKSONVILLE, Fla. (AP) — Blake Bortles completed 6 of 9 passes for 53 yards and scored on a short bootleg. Bortles was poised in the pocket and nearly perfect in one series of work, a significant improvement from the way his preseason started a year ago. Bortles had a five-interception performance during a training camp practice in 2017 and continued to struggle during joint practices with New England. He was benched two weeks into the preseason and had to earn the starting job. A year later, his starting spot is as solid as just about anyone’s on the team. It showed against the Saints. Bortles led the Jaguars on a 15-play, 79-yard drive to open the game. He converted both third-down passes he faced and finished off the series by going untouched around the right side. Mark Ingram, suspended the first four games of the regular season for violating NFL policy on performance enhancers, carried seven times for 23 yards and a touchdown. Ingram scored against Jacksonville’s backups and after a 15-yard unsportsmanlike conduct penalty kept the drive alive. MIAMI GARDENS, Fla. (AP) — Buccaneers kicker Chandler Catanzaro made a 26-yard field goal with 23 seconds left to cap a 67-yard drive and give them the win. Ryan Tannehill completed passes on the first four plays in his return from two serious injuries to his left knee, sparking a 40-yard drive that ended with a missed field goal in his only series. Tannehill, seeing his first action since December 2016, was off-target on his final two throws and finished 4 for 6 for 32 yards. Tampa Bay’s Jameis Winston played the second quarter against Miami’s second team and led a group of reserves to 10 points on drives of 32 and 40 yards. He went 11 for 13 for 102 yards in four series. Winston is suspended for the first three games of the regular season for violating the NFL’s personal conduct policy. Dolphins receivers Kenny Stills and Albert Wilson and defensive end Robert Quinn protested during the anthem. Stills and Wilson kneeled behind teammates lined up standing along the sideline. Quinn stood and raised his right fist. There were no apparent protests by the Buccaneers. FOXBOROUGH, Mass. (AP) — Colt McCoy outplayed Brian Hoyer in a scrimmage of backup quarterbacks, while Tom Brady and Alex Smith stayed on the sidelines counting their money. On the day the Patriots reportedly sweetened Brady’s contract with $5 million in incentives, the reigning NFL MVP sat out the team’s exhibition season opener. So did his Washington counterpart, Smith, who was traded to the nation’s capital in the offseason and received a four-year, $94 million extension. In their place, McCoy completed 13 of 18 passes for 189 yards and two touchdowns as Washington opened 17-0 lead in the first half. Hoyer struggled against the Washington starters, but drove New England to a pair of second-half touchdowns, including Ralph Webb’s 8-yard run for a score followed by the catch on a 2-point conversion that gave New England its first lead. Washington was hit with a slew of injuries, including second-round draft pick Derrius Guice, who left with a knee injury after a 34-yard run (which was negated by a penalty) near the end of the first quarter. Also needing medical attention: TE Manasseh Gardner (knee), and WR Trey Quinn, who took a hard shot in the side from Patriots cornerback Ryan Lewis and took a few minutes to get up before heading to the medical tent. BALTIMORE (AP) — Joe Flacco threw a touchdown pass on his only series of the game and rookie quarterback Lamar Jackson ran for a score. Baltimore led 17-0 after the first period and cruised to the finish against the Rams, who rested offensive stars Jared Goff and Todd Gurley. After sitting out the Hall of Fame Game last week, Flacco went 5 for 7 for 71 yards during a 10-play drive. The 11-year veteran overcame a second-and-25 with a 30-yard pass to newcomer Michael Crabtree and finished with a 6-yard TD throw to Patrick Ricard. Jackson entered the next time Baltimore got the ball and coolly directed a 73-yard march in which he completed a 36-yard pass to Chris Moore and broke two tackles running for a 9-yard touchdown. The Ravens and Rams held joint practices Monday and Tuesday, and Los Angeles coach Sean McVay indicated the work against outside opposition would enable him to rest a few of his starters in the preseason opener. He did. GREEN BAY, Wis. (AP) — Marcus Mariota looked sharp orchestrating yet another new offensive system for the Tennessee Titans. Green Bay Packers receiver Davante Adams needed just one series to show he was in midseason form. Mariota was 2 of 3 for 42 yards with a 4-yard scoring pass to Darius Jennings on the opening drive of Mike Vrabel’s first preseason game as Titans coach. Mariota also had one carry for 7 yards before leaving after the nine-play series. It was a nice, if brief, start for Mariota. He’s picking up a new scheme under his third head coach in four seasons. Backup Brett Hundley did his best impression of Aaron Rodgers by hitting Adams in stride down the left sideline for a 48-yard completion. KANSAS CITY, Mo. (AP) — Patrick Mahomes finished 5 of 7 for 33 yards on two drives for the Chiefs as the Texans sat many of their stars. Houston’s Deshaun Watson, coming back from a torn ACL, was used sparingly. He threw one pass — a 4-yard completion to wide receiver Bruce Ellington — during a five-play drive to midfield that featured four handoffs to running back Lamar Miller. Mahomes at No. 10 and Watson at No. 12 were taken in the first round of the 2017 draft. The Texans also sat DE J.J. Watt, who is returning from a broken leg suffered last October against the Chiefs, LB Jadeveon Clowney (knee), offseason addition S Tyrann Mathieu, CB Johnathan Joseph, and starting WRs DeAndre Hopkins and Will Fuller. SANTA CLARA, Calif. (AP) — Dak Prescott made the most of his brief appearance in the preseason opener for Dallas by throwing a 30-yard touchdown pass to rookie Michael Gallup before the 49ers rallied with two late touchdowns.